No, the title does not refer to this blog. Last time I went to Tangra Masala in Queens, which is its real name, there were a few strange characters there and I wrote about them in the post called Mumbles Mumbai Meets Sleepy Bhopal. I intended it to be semi-humorous (your humor mileage may very) but everything I wrote was true. However, I’d been there about a dozen times before with generally good experiences and was prepared to go back, which I did last week. Let’s recap what happened last time. – There was a waiter sleeping in full view of the entire restaurant in our favorite booth. – After he was awakened by some customers, he started serving us, replacing our mumbling waiter, whose every third word was incomprehensible, and who was incapable of getting us lime. – Sleepy argued with us over which sauce we wanted to take home, despite my pointing directly to it, trying to get us to take a sauce for a dish we did not even have, accused us of not listening to him, and started mumbling and complaining about us to the rest of the staff- while he was still at our table. – We were visibly upset and did not leave a tip. When I left the money for our check, the waitress (who was usually pretty good) ran over, grabbed the money, and ran back, never thanking us and making us feel like she was afraid we were running off without paying. Despite all this, we had dozens of good meals there in the past and, despite the occasional hard to understand accent, the food was always good. So we decided to go back and give it another try. We arrived at about 6:30 and the place was empty, which is never a good sign. The entire staff was seated at a table and stared at us when we walked in. We gestured to our favorite table and one of them nodded. After a few minutes of waiting, during which time Saarah told me “They’re staring at us” (my back was to them) one of them came over with menus. This was a waiter we had never seen before, and he spoke perfect, and perfectly polite, unaccented English. It struck me as odd that of all the waiters they’d made sure to give us that one, but I chalked it to them remembering us and giving us good service. Was I wrong. While the service was good, and the food as usual good too, when the bill came I saw that there was a 15% mandatory service charge added to the bill. I had never seen that before and assumed it was new, and idly thought that, ha ha, they must have started adding it because of us not tipping last time. Yeah, as if we were that important, ha ha. Turns out I was almost right. While restaurants have the right to add mandatory tips (that’s what the service charge is), I hate it because it takes away my right to tip whatever I feel is deserved. Sure, I can add more, but I can’t take anything away. What pissed me off right there was that if it were added because of us (more on that later) it meant that the lack of tip last time was in their eyes a reflection of my cheapness and not their awful service. In other words, I was the problem, not the lousy staff. Saarah called her sister, who often also went to that restaurant, and asked if she had ever seen a service charge. She wasn’t sure but believed that it was on her bill the last time she was there. When was that? Coincidently, it was just a couple of days after our bad experience, adding fuel to my theory that it had been added just because of me. Anyway, I was still not egotistical enough to think that I had affected the whole billing structure of an entire restaurant, so I went on Yelp and read some reviews. I found one, back in 2013, complaining that they had added a service charge for a small party of two. So I was wrong that the policy was created just for me, but it was clearly added to my bill just for me in response to my last meal there. I’d been there dozens of times, always tipped, and probably tipped a little higher than most patrons there. (I found out that rarely do those customers reach 10%, let alone 15%.) But because one time their staff has a meltdown, suddenly I’m viewed as a threat to not tip. But while that’s offensive, what really pisses me off is that, as I said, they see me as the problem, not their staff. I deserved an apology, not a service charge! I’m the one who received bad service. I was the one whom a waiter argued with. I’m the one who was insulted. I did not get an “I’m sorry.” I did not even get a “what’s the problem?” I got treated like I caused a problem and when I returned, I was treated like they didn’t trust me. I left the money on the table, service charge and all, and stood up to leave. The waitress, who had not served us at all, rushed over to grab the money before I was even halfway to my feet. She took the money and ran off- not even a thank you. Obviously she wanted to make sure I wasn’t stiffing them. In the past, the staff was so lazy that try as I might, I often could not find anyone to take the money, now the female flash was spiriting it away under my very nose. Worried I’m not going to tip after years of my leaving perfectly good tips? How about asking yourselves- or better yet, ask me- why I didn’t tip that one time. Don’t assume I’m a cheapskate, look at your sleepy, mumbling, combative staff and figure it out. Don’t look at me with suspicion and make me feel like a crook when I’m going to your restaurant with the intention of spending money, tipping, and coming back again! YOU screwed up last time, not me! Meanwhile, you lost me as a customer. For good, this time. 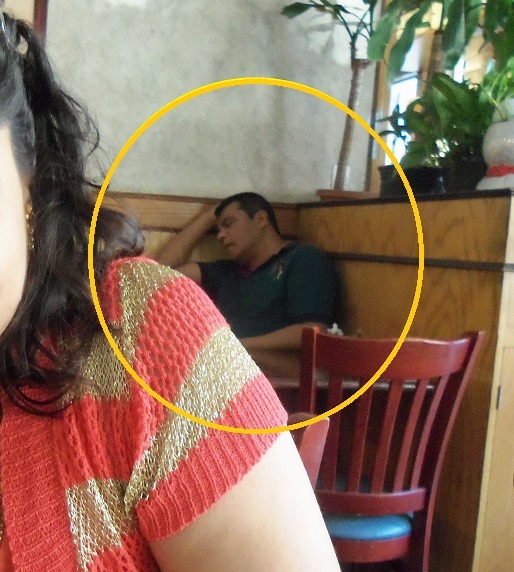 And the picture of the sleeping waiter is gracing my Yelp review. 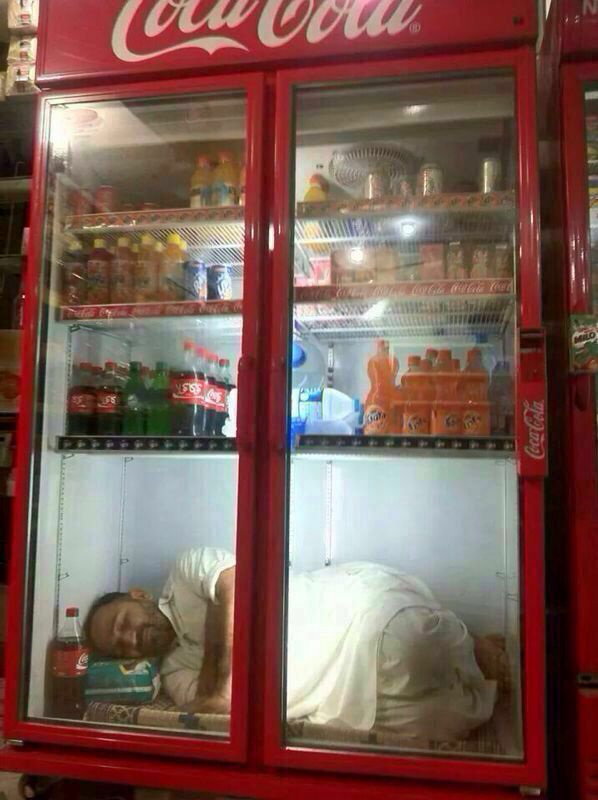 This guy deserves a tip? I don’t mind the “service charge” too much, places have done it here for years too, but mostly just for large parties or for restaurants in tourist areas, like Times Square, where travelers don’t always know American tipping standards. What pissed me off is that the service charge was capriciously added to my bill as an insult and a reaction to my last experience, where I had the bad service. Here I felt it was insulting and punitive. It was also illegal since the law requires restaurants that charge service charges have to clearly indicate it on their menus, which they do not. They are not allowed to spring it on customers without notice. I was (and still am) very, very close to reporting them. I think that restaurant is international! I wonder how much a franchise costs?